Ever wondered where all the downloaded files go on your Mac? By default, most apps will transfer downloaded files into the user Downloads folder. This applies to all downloads to a Mac made from the web with Safari, Chrome, through AirDrop, or from the many file transfer apps out there. 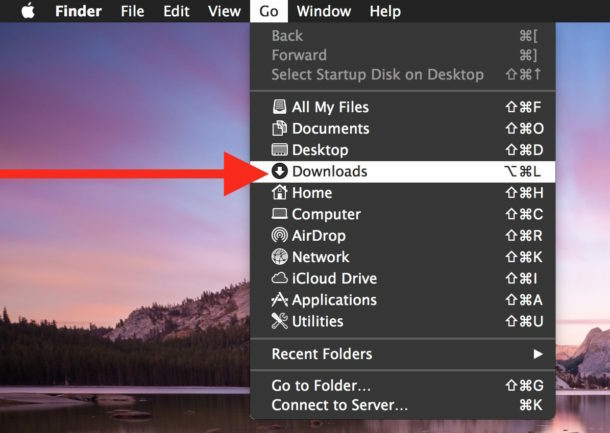 There are many different ways to quickly find and access the Downloads folder on a Mac, we’ll review some of the fastest methods to get to that folder and find your downloaded files. Additionally, we’ll show you two ways to track down downloaded files that for whatever reason didn’t show up in the Downloads folder. 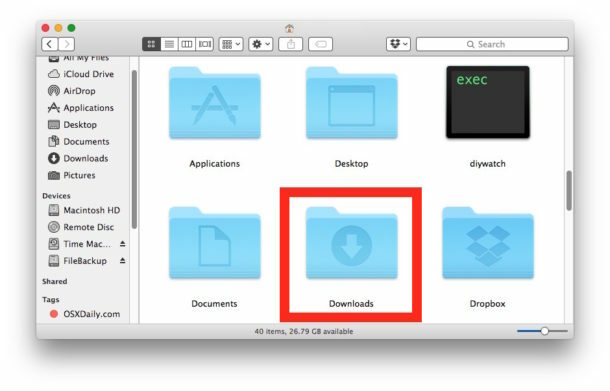 In all versions of Mac OS X and macOS, the user downloads folder is located in the users Home directory in a folder appropriately called “Downloads”. 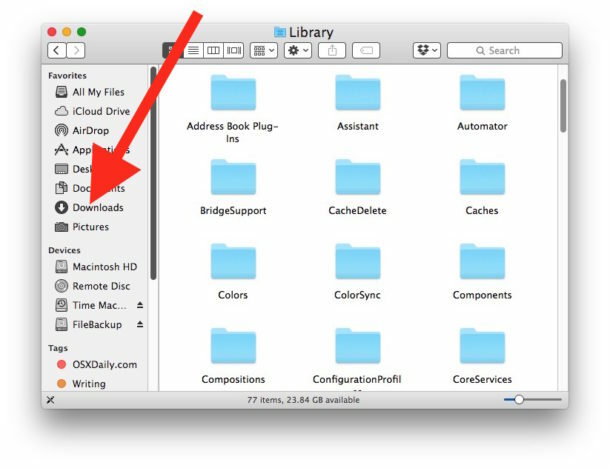 For users who like to use the excellent Go To Folder keystroke function in Mac OS, hitting Command + Shift + G and entering either of the aforementioned directory paths will get you to the specified users Downloads directory. 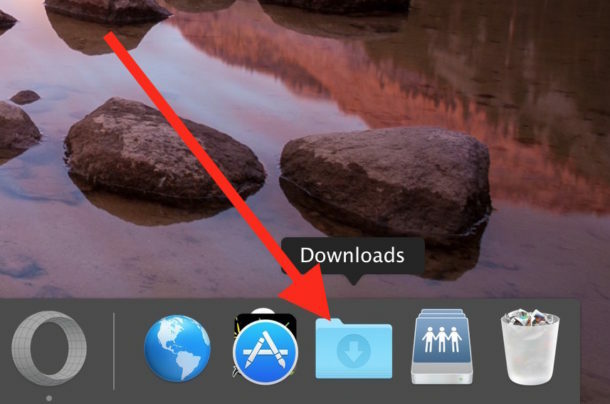 The Downloads folder exists in the Dock of Mac OS by default, so unless it has been removed it will be there for all users to have quick access to by accessing the Dock at the bottom of the Mac screen. It will be located on the right side of the Dock near the Trash can. If you prefer to use keystrokes, you can hit Command + Option + L within the Finder to jump to the Downloads folder as well. Another method of accessing the Downloads folder is from the Finder window sidebar. The “Downloads” option will be there by default unless it was removed. Of course you can also get to the Downloads folder on a Mac by navigating from the users Home directory, where the clearly labeled “Downloads” folder will exist alongside other default folders like Desktop, Documents, Pictures, Movies, etc. Sometimes files download to unexpected places, whether it’s the Desktop or Documents folder or elsewhere. 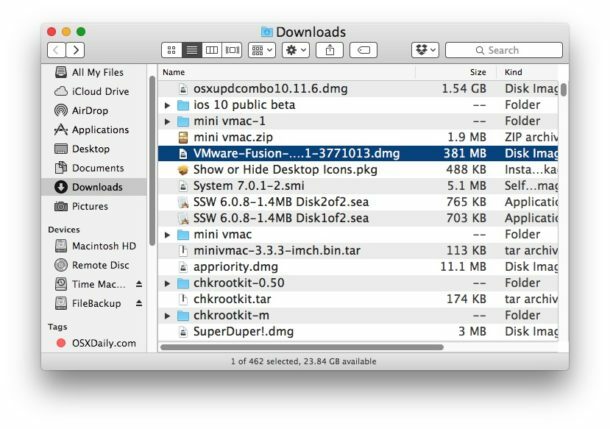 If you looked there and in the Downloads folder and can’t locate a downloaded file on the Mac, your best bet is to use the search features on the Mac. You can either use Finder search or Spotlight to look for files. 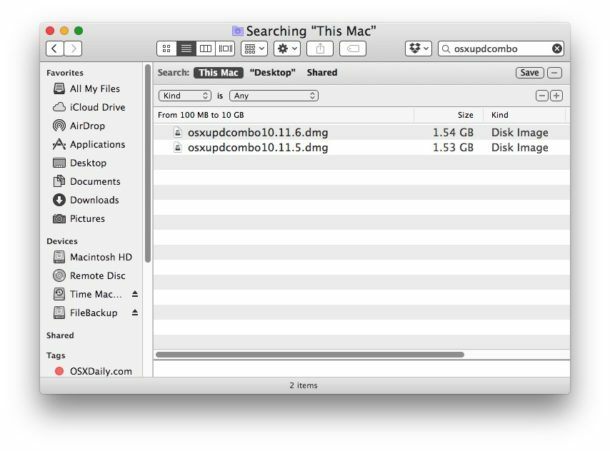 Finder Search must be accessed from a file system window in the Finder. Then from the “File” menu choose “Find” and enter the name of the file to search for. If you prefer keystrokes, hit Command + F from the Finder to bring up the search feature. If you click on a file result in the Finder Find feature, the path to the file will be visible in the Finder windows status bar. Spotlight can be accessed from anywhere on the Mac, all you have to do is hit Command + Spacebar to bring up Spotlight, then type the file name of the downloaded item you are searching for. 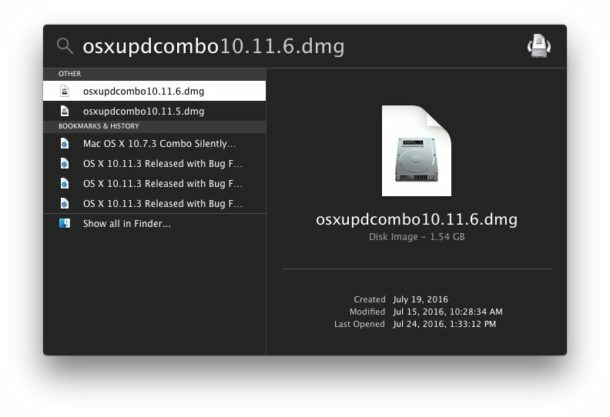 When you find the downloaded file in the Spotlight search result, you can hit the “Return” key to open it immediately, or you can hit Command+Return to open the folder containing the file instead. Finally, it’s worth pointing out that apps downloaded from the Mac App Store will not appear in the Downloads folder, as instead any downloaded app goes directly from the App Store into the /Applications folder on the Mac. Or, you can change the General Preference in Safari “File download location” from”download folder” to “desktop” and never have to search for a download again! The only app that downloads files directly to the Desktop in my case is Thunderbird. All the others put downloaded files in the Download folder. I’ve even written an AppleScript that will clear the Download folder with a keystroke combo, just to save space without having to navigate through the Finder. I often temporarily change my download folder when downloading many files that go in a specific folder. I just have to remember to switch it back to ~/Downloads again when I’m done. Most entry users, find the downloads dock file handy but will in time accidentally delete it. Be nice to let them know how to put it back into the dock, like dragging the “Downloads” file back to the left of the trash can. Why will most users accidentally delete it? Do you mean “some users”? Mail app in some systems was set up by default to send attachments to a “Mail Downloads” folder, where they took up disk space and were usually forgotten about. In Mail’s Preferences>General the path for mail attachment downloads can be set, if desired, to the regular “Downloads” folder. This is the most asked question. Whenever some new person shifts from Windows to Mac in my circle, I get a call to guide them where they can find downloaded stuff. And how they can install an app by just placing it in Applications folder. Hi Steve, this is a post about the user Downloads folder, and accessing files you have downloaded. It has nothing to do with ipfw or firewalls. Have you provided an outline of what happens when you download an app onto the iMac. As an example, lets say you download a word processing package. To install it, you click on the file…and then what ? In Windows, you can go to the download folder after the install and delete the downloaded file (ie: an exe. file). What about with Apple ? For Mac, Applications from the App Store appear in the /Applications folder. There is no installer to remove, it is included in the App Store cleanup. Applications installed from installers tend to download into ~/Downloads/ (or elsewhere if you specified) and also usually install into the /Applications folder (or elsewhere if specified). You can delete the installer after it has finished if you want to. Apple has four OS systems with similar behavior as the macOS App Store process; iOS, tvOS, watchOS. Can not anyone give us a straight answer that works? My download folder disappeared during an update. I don’t have a clue where it is. None of the ‘helps’ (!) above relate to my problem. See if the Downloads folder appears on screen, it should. If it doesn’t, it somehow went missing which would be strange unless it was deleted. I am guessing it is probably just hidden. I seldom download, but when I do I want it to show up on the Desktop as a reminder that I have something new to contend with. I would prefer to never use the download folder, I have no intuition to go to it. How do I avoid it and have everything go to desktop. It varies per application. So how to do it depends on the app you are downloading the files from, what do you usually use to download? Safari? Aside from placing Macintosh HD on the desktop and accessing it directly, you could use Command+Shift+G and enter the path “/” to jump directly to root of Macintosh HD too. Thanks Paul. I use Firefox and it too allows me to chose where I want downloads to go. My question has always been: Why can’t we open files in the Downloads folder directly? Why must we open the DL folder in the finder first? Is it too much to ask to have the functionality directly from the DL folder?